Something has to be visible at one glance. Then it is beautiful, wondrous, and harmonious, and you will know its essence. Wolmyeongdong natural temple is like that. The distance that many people can see at one glance is the overall distance of an international regulation soccer field. 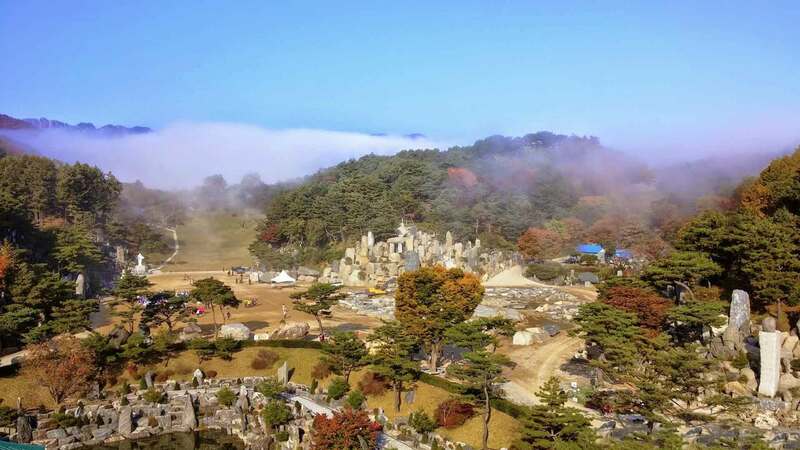 All of Wolmyeongdong, including the lawn temple, the sports field, the rock landscaping, the lake, and the valleys, is at a distance and width that allows you to see everything at a glance. The Natural Temple has the distance and width that allow people to see the rocks, trees, and hills well while walking around. Wolmyeongdong Natural Temple is a temple with a capacity of 30,000 people. In the lawn temple, you can see as many as 10,000~15,000 people at a glance. Moderately, about 3,000 people come in sight at a glance. In Wolmyeong Lake, as many as 1,000 people come in sight at a glance. Moderately, about 300 people come in sight at a glance. Wolmyeongdong was small at first. However, when the areas in Wolmyeongdong that were slack and stretched out were cut and trimmed, it became wide. Once we developed it like that, the distance between the front hill and the back hill grew to be 100 meters. It became 200 meters deep and is now oval-shaped. Things in Wolmyeongdong such as the Ambition masterpiece, grass lawn, sports field, lake, and the Holy Son’s House of Love do not change no matter when you look at them. It is because they have already been made. If something is truly made, it will not change. When you go to Wolmyeongdong, you can clearly feel that the trees, rocks, water, and the lawn exist for people. That is creation giving glory to people. Creation being alive and existing for human beings is creation giving glory to the Holy Trinity. People giving glory to the Holy Trinity out of thanksgiving while using that creation is all giving glory to the Holy Trinity. The Trinity love us. We must know that and give glory to Them. Because Pastor Jung Myung Seok learned from the Holy Son, he realized the value of creation. And by loving creation, he brought into Wolmyeongdong rocks and trees that have deep stories. He made a lake, made the lawn sanctuary, made trails and built pavilions, and he purchased land that had God’s Will and developed it into God’s temple. He taught Heaven’s language so that as we look at that creation, we will know and feel God’s love, and as we look at creation in the midst of our daily life, we will live knowing that God is speaking to us and He is with us.